Cleaning and external repair/redecoration works on the prestigious Prudential building in London’s High Holborn called for the scaffolding and access installation to meet clearly defined objectives. 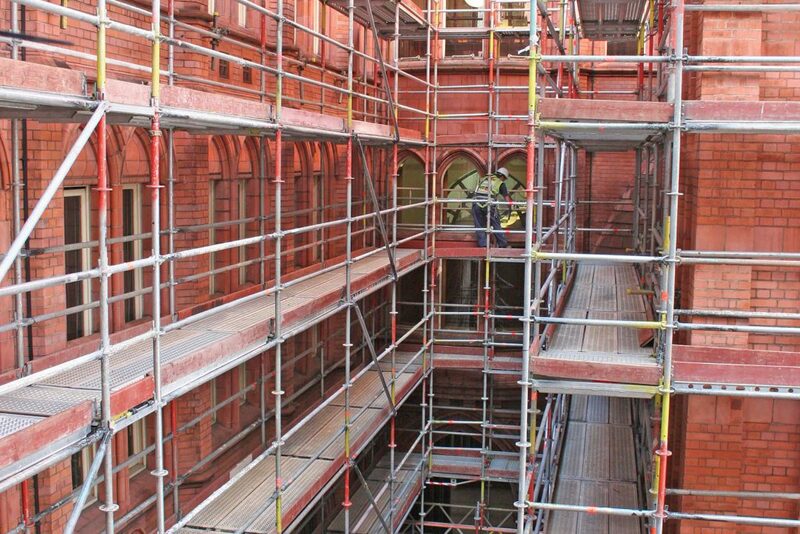 TRAD Scaffolding, using Layher equipment, provided a three-phase solution for Isis Restoration – delivering multi-level, simultaneous access on a number of the building’s facades. The structure incorporated access stairtowers and cantilevered material gantries and utilised the Allround® system which provided wide bay access and, importantly, no cross bracing. “The modular design helped fulfil the Isis Restoration commitment to meeting high quality visual standards,” comments Nigel Mardon, Senior Contracts Manager at TRAD Scaffolding, who also highlights the significant handling advantages of Allround® – important in an area where crane access is not possible. Significantly, the small number of standards with the scaffold system also reduced the need to create tying-in locations – important with a listed building of this type.